While discussing with my brother the frustration I was having with expensive arcade parts from online stores, he told me that I should check on eBay as items can be listed cheaper and I could find a good deal on there. So off the eBay I went and he was right. While shopping around for arcade parts for the arcade, I came across a multicolor joysticks and buttons bundle on eBay from DirtCheapTrading. This includes 2 joysticks and 14 buttons of the colors they have listed for your choosing. Since I am copying my brother's setup, I will need 6 buttons for players one and two, and 4 buttons for players three and four. The 6 buttons will be to handle most fighters, and the 4 buttons for players three and four, is for Dungeons and Dragons games, which need 4 buttons to play. All the other 4 player games usually use 2 buttons. I will also need the buttons for 1 - 4 player and an exit button. In total I will need 25 buttons (12 for players One and Two, and 8 for players Three and Four, plus Player 1,2,3,4 buttons and an exit button). I will need to by two sets of this bundle to get all the buttons I need and I will have extras as well. I am also going to need to figure out how to handle the 1-4 coin up option within games. 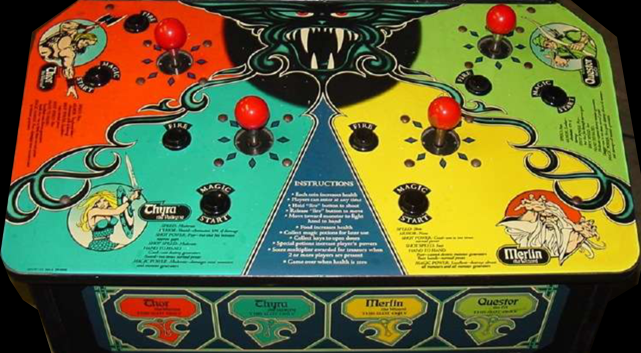 I have given this some thought, and I do not want to have to bother with inserting a quarter into the machine multiple times for every game I play, and also have to deal with 4 people doing this simultaneously, so I believe I will give each player their own color button to "Coin Up" in the game. I can handle this with the extra buttons I will have left over from the bundle deal from DirtCheapTrading. I have had more ideas for my MAME cabinet. Since I will be using the multiple colors of joysticks and bundles, I plan to make this work with the artwork I want to do for the control panel. Instead of having two opposing forces flying at each other, I want to have each player represented by a certain color and have corresponding arcade charters represent that color on the control panel. This is somewhat reminiscent of the Gauntlet or TMNT arcade control panels. I would also like the characters on the panel to be interacting with each other. This is probably a too daunting task for someone with very little artwork skills, but I like a good challenge. That is it for this blog post. I hop you are enjoying yourself so far, I know I am! Till next time, Goodbye!